So glad to be back to "normal" life after the whirlwind of December, Christmas and the preparations for CHA show. The date of this years show was so close to Christmas that many of us in the industry sacrificed much (including blogging) to make everything happen in the time frame. I am looking forward to 2017 when the show will be moved to Phoenix and the date will be more conducive to spending holiday time with family instead of making samples. So let me jump off my soapbox and let you in on some of the behind the scenes work that took place this last month. 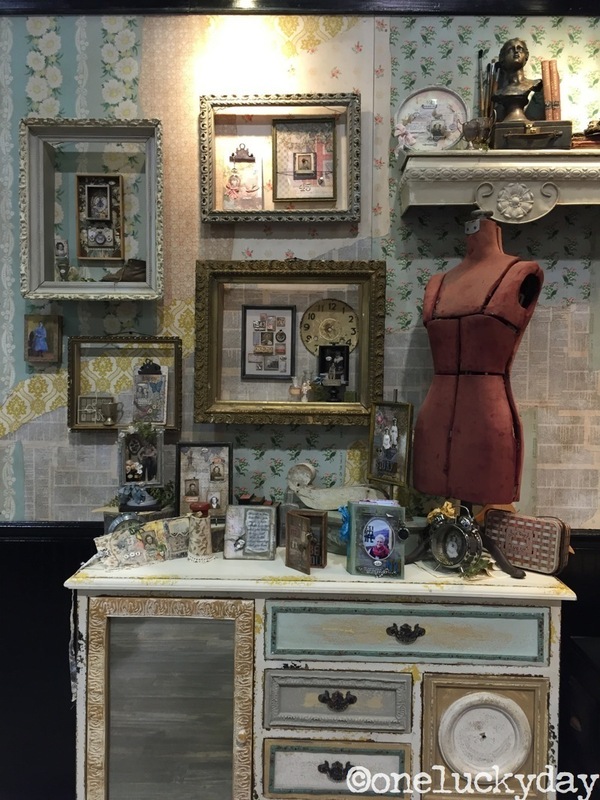 Today I'm talking about one of the walls that was created for the idea-ology booth. Tim and I usually start talking about the booth 6 months prior to show. It's always better to have a plan to work from than throw something together at the last moment. 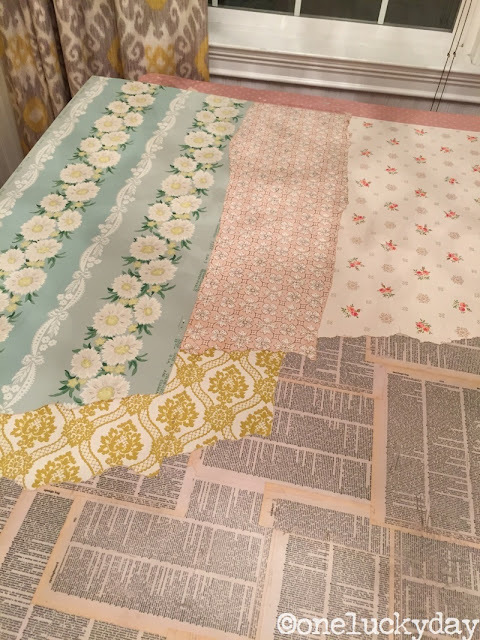 Even with the advance planning, the right side of the booth seemed lackluster so I looked back through some ideas I has saved and ran across a picture of a backdrop with vintage wallpaper. I did some research on vintage wallpaper and found a site on Etsy called Hanna's Treasures that sells hundreds of rolls of it. 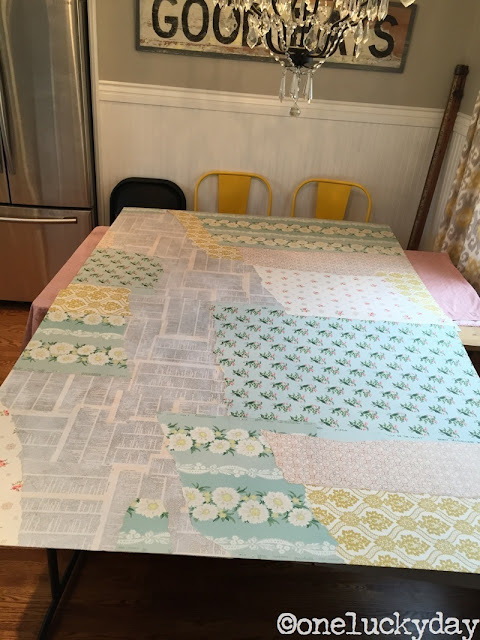 I put together a virtual inspiration board with the idea, samples and cost and sent it off to Tim to see what he thought. He sent back an email that said, "go for it!" (that is the kind of guy he is...super positive, always supportive, and is 'all in' when it comes to a crazy idea!). Every December, Richele comes to stay for a week and we work on CHA projects together. This time it included helping me create the walls for the booth. She is a great partner in crime because she is a hard worker, not afraid of power tools and is willing to try. Can't ask for more than that! 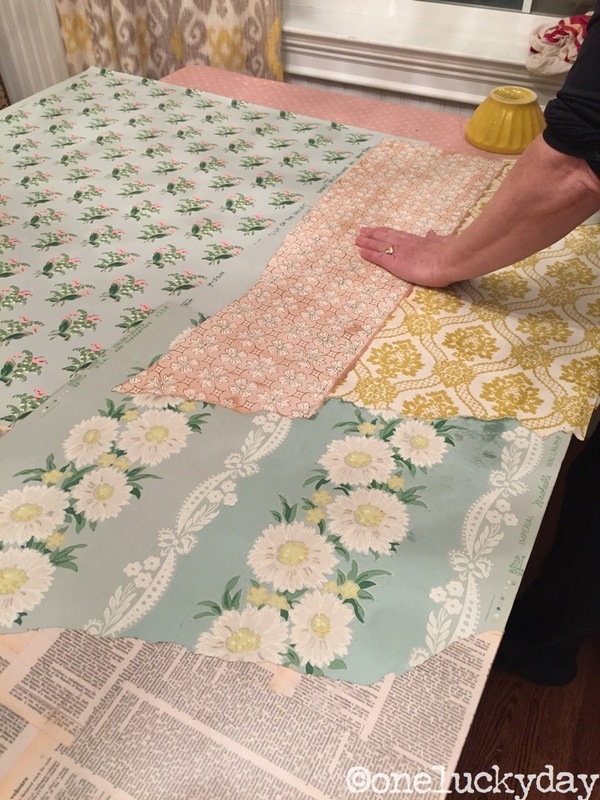 To prepare, I placed an order for 4 vintage wallpapers and within a week they were delivered. Jay went to Home Depot and bought 2 wood "skins" (as I like to call them) for $9.97each. They are super thin wood sheets 48 x 96" (Home Depot calls them a Utility Panel). Jay had them cut to fit the booth walls (and the back of the Jeep - because if they do not fit in the car, we're in trouble). Jay painted the skins with some leftover house paint so the surface would be sealed. Richele as I worked on one panel at a time on my kitchen table. 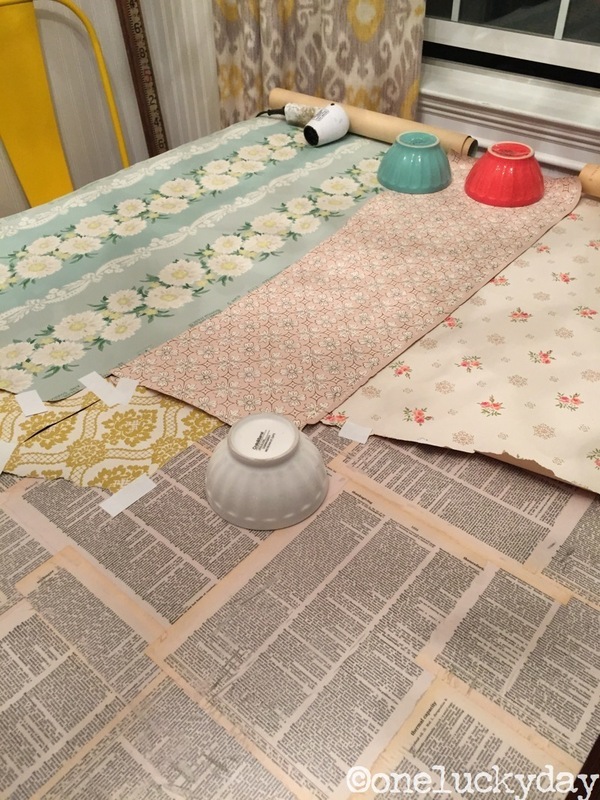 First we added dictionary pages with Mod Podge since we wanted to break up the wallpaper. Jay helpd in the drying stage (thank goodness for Heat It tools). 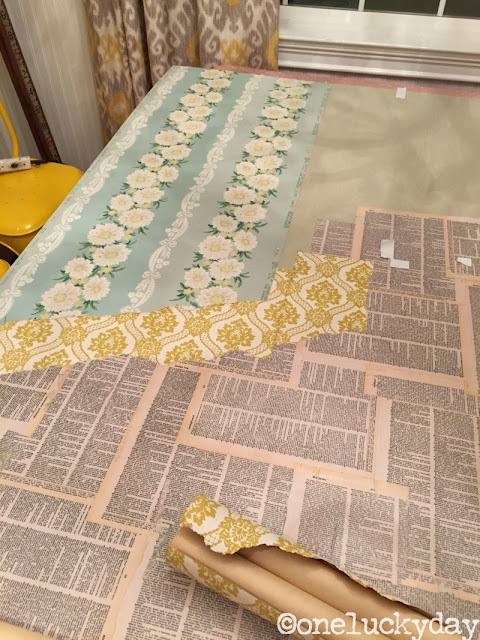 We started laying out the wallpaper (had to plan since we had a limited amount of the vintage wallpaper). 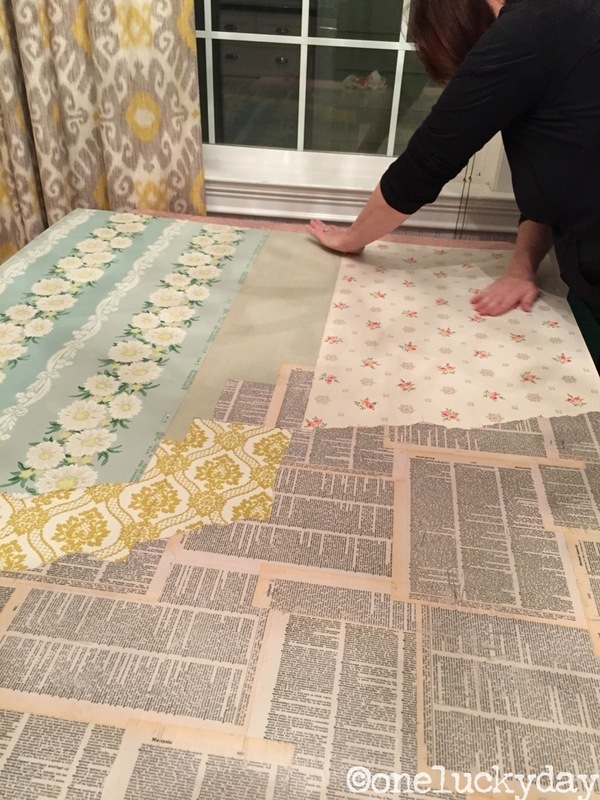 We used Post-it note tape to tape down the pieces where we could (the paper just wants to curl up). Once we had a plan and we had made the proper rips, we got to work adding the paste to the back. One by one, we added each paper to the board. lol, notice it's now night time? 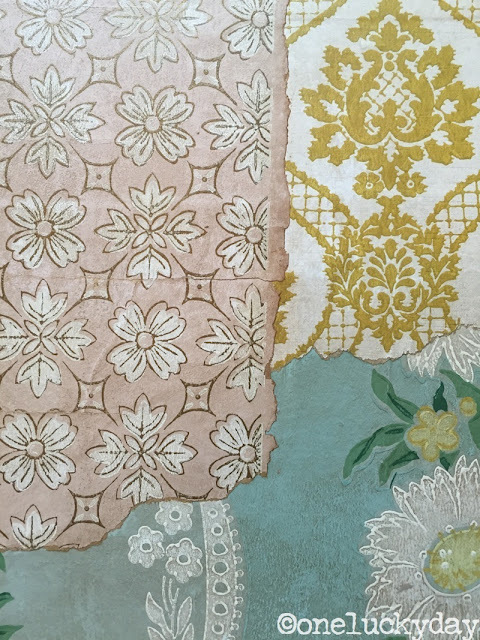 Lucky for me, I had the pink wallpaper that I had picked up many years previous. 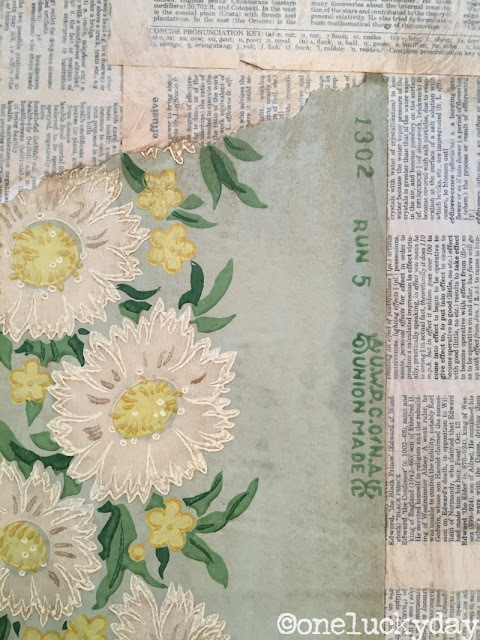 I was digging for something in the craft room and found the rolled up piece. Talk about serendipity!! We moved on to the second board where things got a bit trickier since the paper was running low. 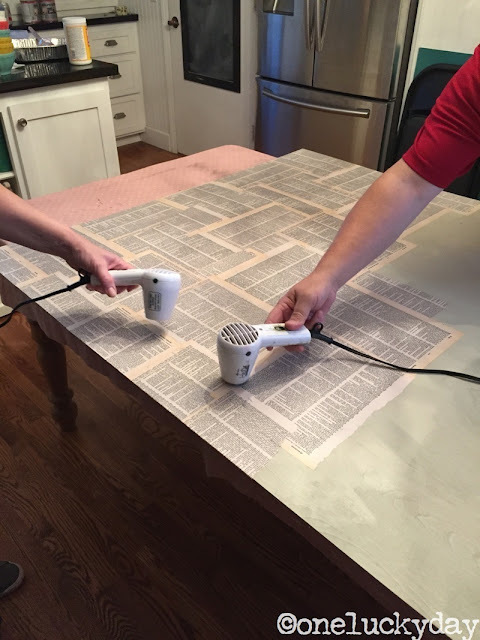 The next day, we decided the dictionary paper was a bit too bold so we watered down some white paint and white-washed it. Much better! We added a few of the smaller pieces that were left, to the bottom of the boards. Hard to take of picture of the boards together but we knew we loved the different prints, the text that was purposefully left on, and just the overall look it would bring to the booth. The last step was to glaze the entire piece, to knock back the "new" and make it look very vintage. I did this step so I didn't get any pictures but you can see in these close ups that the glaze makes it complete. 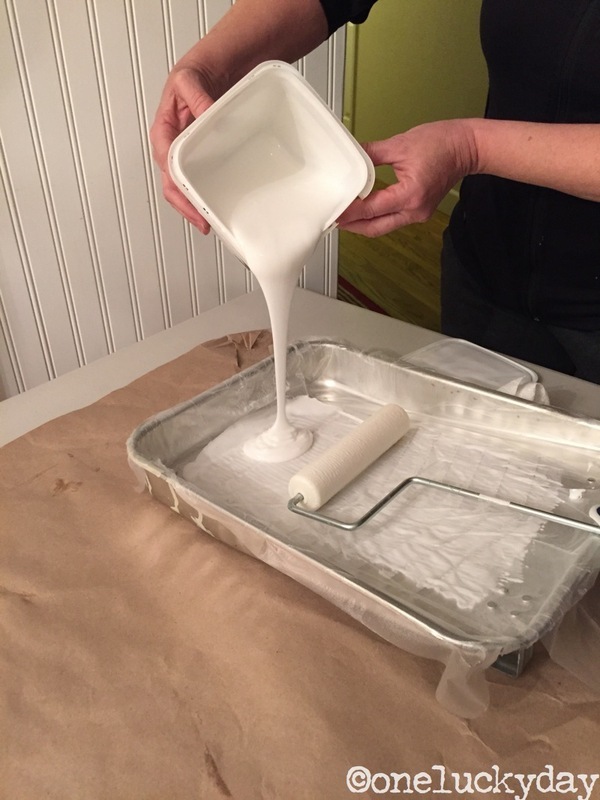 I had the Ralph Lauren glaze in my garage from a previous project. I do not believe RL sells it anymore but I'm sure others do in the faux finishing section of HD. 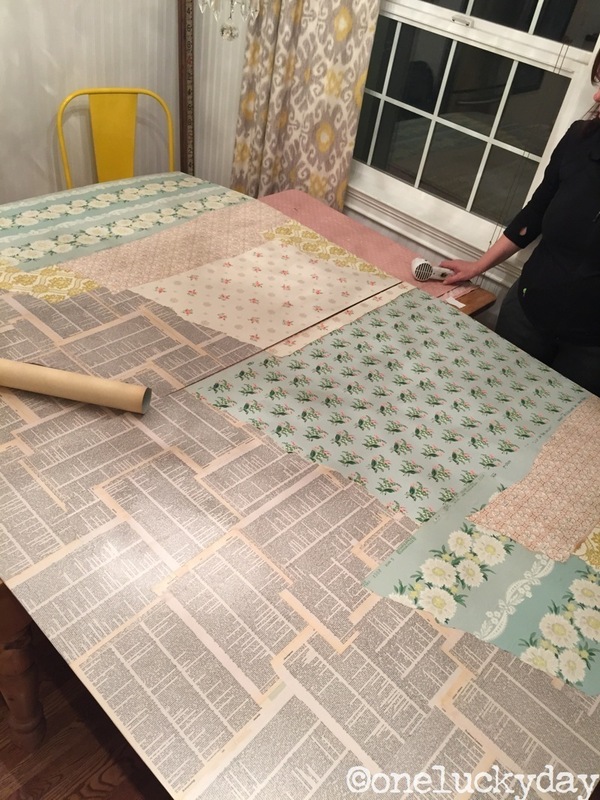 I hope you liked reading about the Vintage Wallpaper adventure. The walls are now at home with me...currently in my living room waiting for a home to live. I am sure you will be seeing them used as backdrops for future photos! Both Tim and Richele have done great posts about the idea-ology booth. I sure hope you will stop by their blogs to see some great pictures! 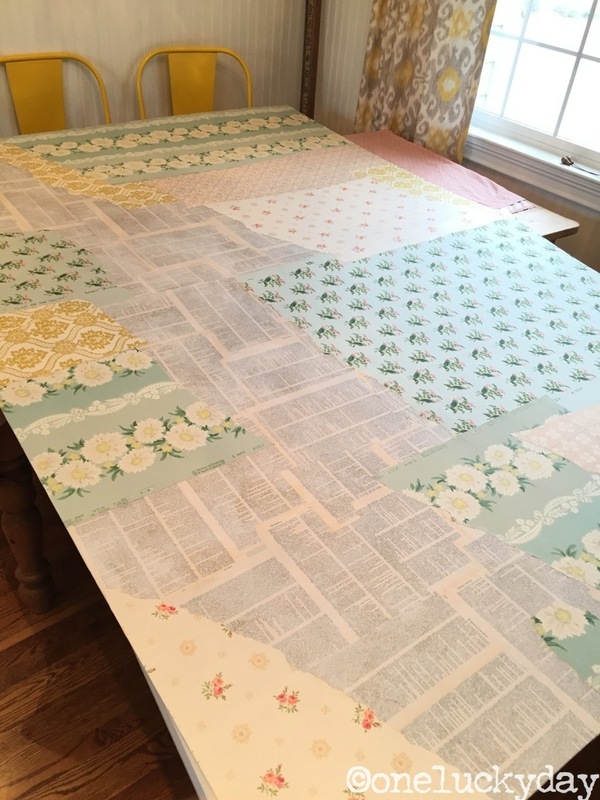 These boards were little labors of love that paid off! They looked terrific in the idea-ology booth! Love how you white washed over the dictionary paper to tone it done. So fun to see how these vintage walls came together. 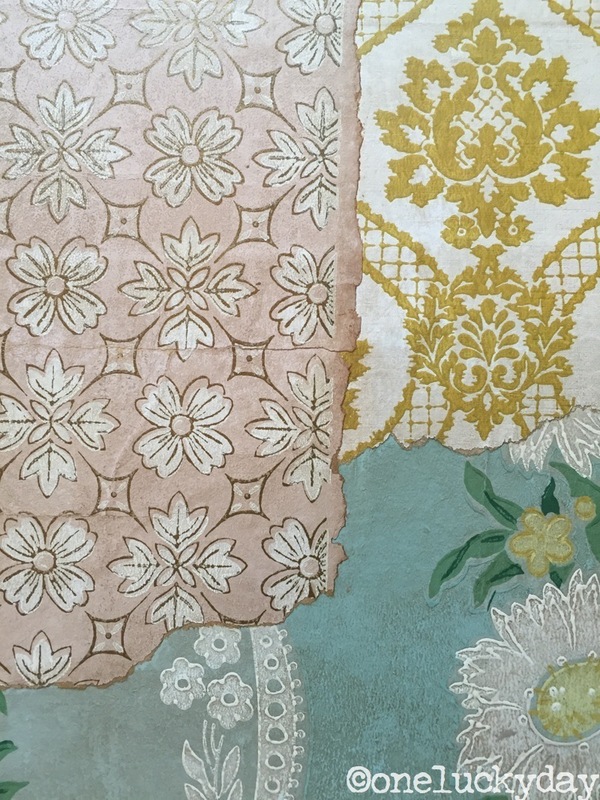 The vintage walls are fabulous! I bet the booth looked great at CHA! I LOVE that vintage wallpaper! Gonna have to check out the site and see what I can find to use in my crafting. How clever! You just have no idea what and how much goes on behind the scenes. I sat and ate my lunch while reading about the wallpaper adventure. Thanks for sharing, it was fun to see how it came to pass. Wow Paula, so much work goes into all of this, Like Anne said, it's so easy for us to take it all for granted when we see the finished things.... This CHA was very special with all the Periscopes being shown all over the net, - this post just filled in some of the behind the scenes things beautifully! So thoughtful to think of taking all those photos and you are right in the thick of it. You and Richelle make one awesome team, Tim is so lucky to have you! thank you Astrid. We DO make a great team because we are both easy going. Just wish we lived closer than 5 hours away! I really appreciate the "behind the scenes" info. It's a beautiful backdrop, perfect for your display. Very cool!! Looks like fun!! funny, me too and I was there! How fun! What a blessing for you to have such a creative job! BTW, I couldn't help but notice your cute yellow metal chairs. I am considering buying similar ones in grey. Do you have cushions for yours or are they ok without? I love the metal chairs (I got mine at World Market a few years back). We do not use chair pads as I like the simplicity of being able to wipe them down when necessary. I love those walls! And I missed your posts, Paula.